The boys basketball varsity basketball team lost their district final game last night to Zane Trace 51-45. The Falcons were led by Evan Conley with 20 points. The Falcons finish the year 16-9 district runners-up, second place in the MSL, and Sectional Champs. Go Falcons! The boys basketball varsity basketball team won their district semi-final game last night 50-39 over Washington Court House. The Falcons were led by Chase Poston with 17 points and Huston Harrah added 15. This win advances the Falcons to the District Final vs Zane Trace Sunday, March 10th, 3 pm at the Convo. Pre-Sale tickets are available in the main office. Go Falcons! The boys basketball varsity basketball team won their sectional final game this Saturday 48-33 over Marietta. The Falcons were led by Evan Conley with 20 points and Huston Harrah added 12. This win advances the Falcons to the District Semi-final vs Washington Courthouse this Thursday at 8pm in the Convo. Pre-Sale tickets are available in the main office. Go Falcons! The boys basketball varsity basketball team lost their final regular season game last night to Beechcroft 48-41. The Falcons were led by Evan Conley with 18 points and Chase Poston added 13pts. With his 18pts Evan surpassed the 1,000 point mark for his career. The Falcons will open up tournament action Saturday at noon vs the winner of Westfall and Marietta tonight. Pre-Sale tickets are available in the main office. Go Falcons! The boys basketball varsity basketball team defeated Liberty Union 59-48 Friday night in their last league game of the season. The Falcons were led by Evan Conley with 26 points and Huston Harrah added 19pts. This made the Falcons finish with a 9-5 in league play, finishing in second place behind Teays Valley. 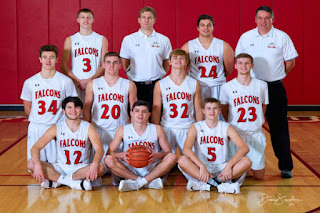 The Falcons will be back in action Monday night for their last regular season game of the season vs Beechcroft. No freshman, JV tips 5:30pm, Varsity Tips 7:30pm. Go Falcons! The boys basketball varsity basketball team won last night vs Tree of Life 61-31. The Falcons were led by Evan Conley with 14 points, Ryan Magill added 13pts and Huston Harrah had 12pts. The Falcons will be back in action Friday night for their last league game vs Liberty Union. No freshman, JV tips 6pm, Varsity Tips 7:30pm. Go Falcons! The boys baskFalcon 7th grade boys won their opening tournament game 30-24 vs Logan Elm. The Falcons were lead by Caleb Schmelzer with 11pts. Caleb Redding added 7. Next up is Rival Bloom Carroll Thursday the 14th in the semifinal game at 6 15pm at Circleville high school. The boys basketball varsity basketball team won Saturday night vs Circleville 67-43. 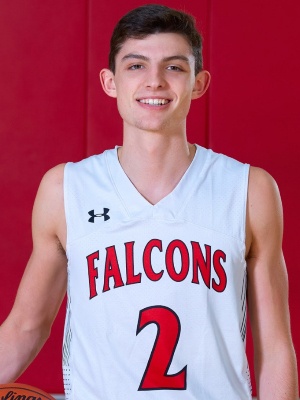 The Falcons were led by Evan Conley with 21 points. The Falcons will be back in league action Tuesday on the road vs Tree of Life. No freshman, JV tips 6pm, Varsity Tips 7:30pm. Go Falcons! The boys basketball varsity basketball team lost last night vs Teays Valley 49-42. The falcons were led by Chase Poston with 15 points. 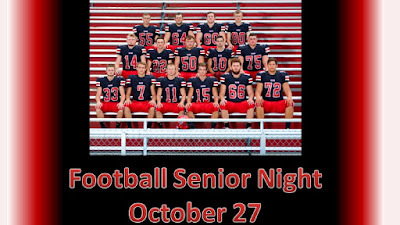 The falcons will be back in league action Saturday night for senior night vs Circleville. 4:45 Freshman, JV tips 6pm, Varsity Tips 7:30pm. Go Falcons! 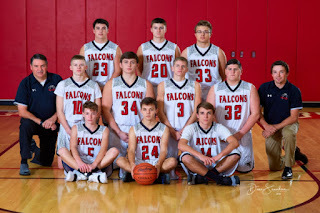 The Falcon 7th grade boys basketball team beat Amanda Tuesday night 37-16. Next up is LU at home Thursday night starting 5pm. They are also seeded 3rd in the MSL tournament and will open up with Logan Elm Saturday afternoon 1:45 PM at Circleville high school. The boys basketball varsity basketball team won a big road game last night 40-38 vs Amanda. The Falcons were led by Evan Conley with 18 points. 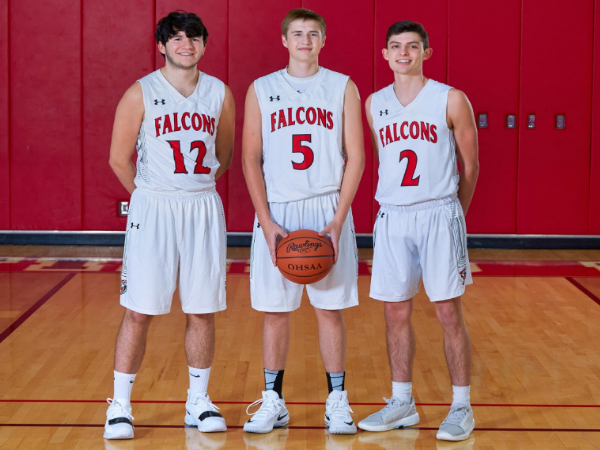 The Falcons will be back in league action Thursday night at home Teays Valley. 4:45 Freshman, JV tips 6pm, Varsity Tips 7:30pm. Go Falcons! Falcon 7th grade beat Circleville on the road 29-28. Avery Phillips lead the Falcons with 13 pts. Caleb Schmelzer hit a late free throw to put us up by one. The Falcons take on Amanda Tuesday 5pm at home. The boys basketball varsity basketball team won Tuesday night 59-39 at Vinton County. The Falcons were led by Huston Harrah with 17 points and Evan Conley with 15 points. Go Falcons! 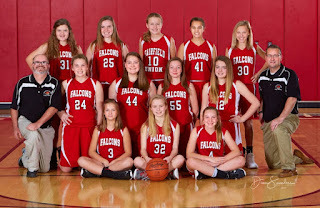 Falcon 7th grade basketball team lost a close one Saturday to Hamilton 36-35. 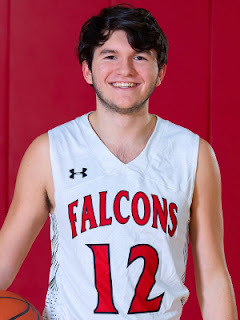 Caleb Schmelzer lead the Falcons with 11 pts. Avery Phillips with 10 and Caleb Redding with 5. Next up for the Falcons is Teays Valley at home Monday evening. The boys basketball varsity basketball team lost last night 59-46 at home to Hamilton Township. The Falcons were led by Evan Conley with 24 points. The Falcons will be back in action Tuesday night on the road at Vinton County. 4:45 Freshman, JV tips 6pm, Varsity Tips 7:30pm. Go Falcons! The boys basketball varsity basketball team lost last night 41-30 on the road vs Logan Elm. The Falcons were led by Huston Harrah with 9 points while Evan Conley added 8. The Falcons will be back in action Saturday night at home against Hamilton Township. 4:45 Freshman, JV tips 6pm, Varsity Tips 7:30pm. Go Falcons! The boys varsity basketball team was victorious Friday night winning 42-31 over Bloom Carroll. The Falcons were led by Evan Conley who led the way with 16 points while Huston Harrah added 10, Chase Poston 8 and Ryan Magill 6. Thank you to all who came to the game, it was a great atmosphere. The Falcons will be back in action Tuesday on the road vs Logan Elm. No Freshman, JV tips 6pm, Varsity Tips 7:30pm. Go Falcons! 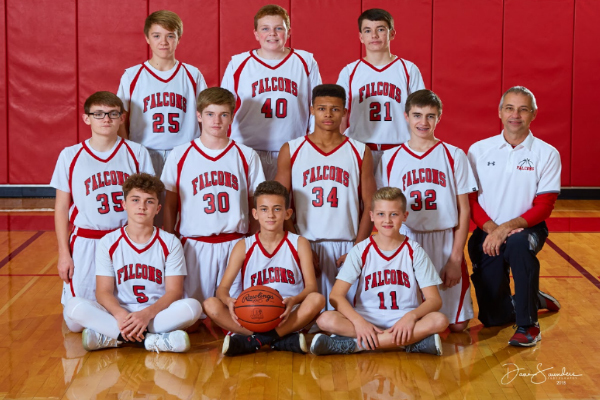 The Falcon 7th grade boys jumped out to a 34-13 first half lead and ended up with the win 50-40 vs Logan Elm Thursday night. The Falcons were lead by Caleb Boyer with 14pts, Caleb Redding with 12, Avery Phillips added 9 and Kyle Wolfe chipped in with 5. That pushes their record to 6-4 on the year. Next up is Nelsonville, Tuesday night in a non-league game. The boys basketball teams were victorious last night with the JV, and Varsity winning over Liberty Union. The varsity capped off the night with a 54-39 victory. The Falcons were led by Huston Harrah who led the way with 22 points while Chase Poston added 14 and Evan Conley added 13. Thank you to all who came to the game, the place was rocking. The Falcons will be back in action Friday at home vs Bloom Carroll. Look forward to see all of Falcon Nation out, lets pack the gym. Freshman tip 4:45pm, JV tips 6pm, Varsity Tips 7:30pm. Go Falcons! The Falcon 7th grade basketball team lost a tough MSL battle at LU 26-22. Caleb Schmelzer lead the Falcons with 9pts. Last night the boys travelled to Liberty Union and came home with a big win 30-25. The Falcons were led by Isaac Schmelzer who had 9 points and Bremen Rowles who had 6 points. This makes the boys’ record 5 - 3 overall and 4 - 3 in the MSL. The boys will play at Bloom Carroll on Monday. The boys basketball teams were victorious last night with freshman, JV, and varsity winning over Circleville. The varsity capped off the night with a 54-40 victory. The Falcons were led by Evan Conley with 19 points and Huston Harrah added 15. The Falcons will be back in action Saturday in a big league game at home vs Liberty Union. Look forward to seeing all of Falcon Nation out in support. Freshman tip 4:45pm, JV tips 6pm, Varsity Tips 7:30pm. Go Falcons! Falcons were lead by Caleb Boyer with 14pts. Caleb Schmelzer added 10. Avery Phillips with 7. That's puts their record to 5-2 and 4-2 in the MSL. The 8th grade boys were back in action last night after the holiday break against a gutsy Circleville team. The Falcons prevailed in overtime 55-50. Brennen Rowles had 17 points and Kevin Hazelwood had 12. This makes the boys'record 4-3 overall and 3-3 in the MSL. The boys play again Thursday at Liberty Union. The boys basketball team went 2-0 over weekend, beating Amanda Clearcreek 54-49 Friday night and then defeating Sheridan 69-61 Saturday night. 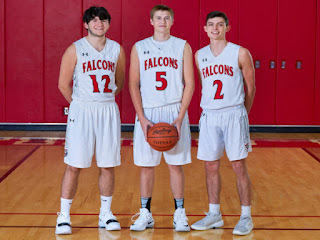 The Falcons were led by Evan Conley, who averaged 24 points over the two games and Chase Poston who averaged 16 points. The Falcons will be back in league action tomorrow night on the road vs Circleville. Freshman tip 4:45pm, JV tips 6pm, Varsity Tips 7:30pm. Go Falcons! The boys basketball team went 1-2 over Christmas break, winning their second league game vs Teays Valley 50-39. The Falcons were led by Evan Conley who had 23 points and Huston Harrah added 15. The Falcons will be back in league action tomorrow night at home vs Amanda, look forward to seeing all of Falcon student section out in force. Freshman tip 4:45pm, JV tips 6pm, Varsity Tips 7:30pm. Go Falcons! 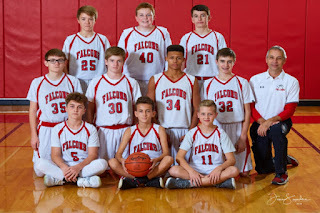 7th grade boys basketball beat Amanda Thursday night 47-5 the Falcons were lead by multiple scorers. Caleb Redding lead the Falcons with 8pts, Caleb Boyer and Trace Pennell had 6 each. Ty Fisher added 5. That pushes their record to 5-1. The boys basketball team fell to Hamilton Township on the road last night 55-50. The Falcons were led by Ryan Magill 19 points and Huston Harrah added 14. The Falcons will be back in league action on the road Saturday night vs Teays Valley. Freshman tip 4:45pm, JV tips 6pm, Varsity Tips 7:30pm. Go Falcons! The Falcon 7th grade boys beat Teays Valley East 40-30 in a MSL game Monday night. Caleb Schmeltzer lead the Falcons with 17pts along with Avery Phillips with 13pts. That puts the 7th grade record to 4-1. Next up is Thursday at Amanda. Last night the 8th grade boys traveled to Teays Valley East and came home with an impressive victory 51 - 38. The Falcons were lead by Isaac Schmelzer who had 17 points and Kevin Hazelwood who added 10 points. The Falcons travel to Amanda on Thursday. The boys basketball team got its first league win to improve to 3-1 overall vs Logan Elm last night. The Falcons were led by Evan Conley who had 25 points and Huston Harrah added 20. The Falcons will be back in league action on the road Tuesday night vs Hamilton Township. Freshman tip 4:45pm, JV tips 6pm, Varsity Tips 7:30pm. Go Falcons! The 8th grade boys basketball team played an incredibly physical game against Hamilton Township last night and came up a little short, losing 43 to 42. The team persevered through much adversity throughout the game. Brennen Rowles led the team with 10 points and Sam Hammock had 9. Ronnie Rowley had a great defensive effort and Jayden Pritchard dominated the boards. The boys next game is Monday at Teays Valley East. The boys basketball team beat a very good to Columbus Academy last night 47-43. The Falcons were led by Chase Poston who had 18 points and Huston Harrah added 12. The Falcons will be back in action home Friday night vs Logan Elm. No Freshman game, JV tips 6pm, Varsity Tips 7:30pm. Look forward to seeing Falcon nation there for our first home league game. Go Falcons! 7th grade boys basketball team won a tough battle at Logan Elm Monday with a score of 39-31. Caleb Boyer led the Falcons with 10pts. Caleb Redding had 8 pts , Avery Phillips, Trace Pennell, with 6. Aiden Mccafferty also chipped in with 5. That pushes their record to 2-1. The Falcons take on Hamilton township Thursday 5pm at home. 7th grade boys basketball team won a tough battle at Logan Elm Monday with a score of 39-31. Caleb Boyer led the Falcons with 10pts. Caleb Redding had 8 pts , Avery Phillips, Trace Pennell, with 6. Aiden Mccafferty also chipped in with 5. That pushes their record to 2-1. The Falcons take on Hamilton township Thursday 5pm at home. The boys basketball Freshman and Varsity teams fell to Bloom Carroll Saturday night. The varsity team lost 52-58, Evan Conley led the way with 24 points. The JV team was victorious. The boys basketball team will be back in action Tuesday night vs Columbus Academy at home. Please come out and support the boys basketball team as they try to get back on track. Freshman tip 4:45pm/JV tips at 6pm/ Varsity 7:30pm. Go Falcons! 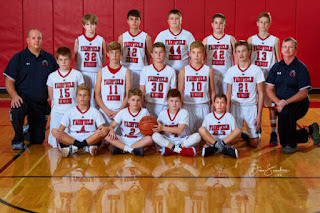 The 8th grade boys basketball team traveled to Athens on Saturday and defeated the Bulldogs 45 to 37. 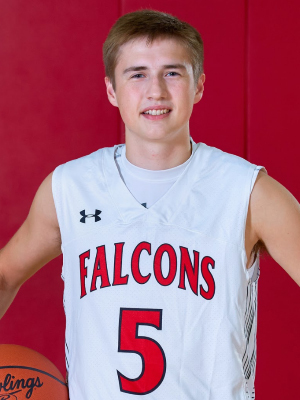 The Falcons were led by Brennen Rowles who scored 10 points and Caden Fyffe added 9 points. The Falcons are back in action on Monday at Logan Elm. The Falcons opened up MSL play vs BC with a tough loss, 41-20 on Thursday. Falcons were lead by Caleb Schmeltzer with 9 points and Caleb Redding with 4. Next up for the Falcons will be Saturday at Athens 10am. 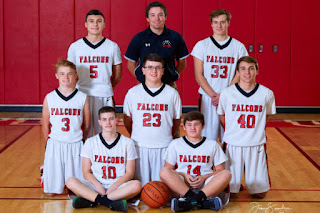 The Falcons 7th grade boys rebounded Saturday with a convincing win vs Athens 25-7. Caleb Schmeltzer and Kyle Wolfe lead the Falcons with 6pts each along with multiple scorers. The Falcons turned up the defense creating 15 turnovers. Next up is Logan Elm away on Monday, 5pm. Last night the 8th grade boys lost a tough game with Bloom Carroll 49-40. A great effort was put forth by everyone. The team was led by Caden Fyffe with 9 points and a great defensive effort by Ronnie Rowley. Coach Johns would like to thank all the students that came to the game. Your support was awesome! The boys basketball freshman, JV, and Varsity won all three of their home opening game this past Friday night against Columbus West with the Varsity capping the night off with a 54-38 victory. The varsity was led by Evan Conley with 19 points, Chase Poston with 12, and Huston Harrah with 11. The boys basketball team will be back in action this coming Saturday opening league play in traveling to Bloom Carroll. Freshman tip 4:45pm/JV tips at 6pm/ Varsity 7:30pm. Go Falcons!